Soon after forming, the Ghosts amassed a great deal of attention. Some of it welcomed, some of it not so welcomed. But bring the music to the people they did. According to The Onion, The Ghosts essentially “infiltrated nearly every level of the city’s culture with their rock and soul whirlpool mixes.” Each set bringing “a different vibe and pastiche of decades worth of grooves, all exclusively mixed in analog.” This is all true. Then “Blackbird” happened. According to OnMilwaukee.com, “Blackbird” is a “masterful mix of vintage sounds from the likes of Joe Tex, James Brown, Bogis Chimes, Bill Coday and others.” The release of “Blackbird,” named for The Ghosts’ defacto home, Bay View’s Blackbird Bar, was timed to coincide with the duo’s first foray into larger audiences. The duo was asked to lend music to Sojourner Family Peace Center’s annual fashion show fundraiser at the Harley-Davidson Museum in 2011. Since then, The Ghosts would see Gulotta’s departure (while staying on as a creative consultant), more sets in more locations and a few shorter form mixes like “Back To The Front”—but nothing has stood out like the two-hour mix “Blackbird” boasted. This isn’t to say “Back To The Front” wasn’t well received. According to Rocksposure.com, “Back To The Front” is the Ghosts’ “most high energy mix to date,” as [the Ghosts] “specialize in assembling amazingly well-crafted mixes of 70’s funk that feel as genuine as Travolta in a set of bell bottoms.” This was of course thanks to Will It Burn’s EightZero at the producer’s chair…but that last effort was back in 2012. So what the hell has Martin been doing since 2012? Plenty. Since Martin last took the Ghosts “back to the front,” he has been more selective about his sets. He’s been calculating and collaborating with DJ Justin Carloni while experimenting with other genres of music. He’s delved into electronica, one of his favorite genres, and he’s worked on the proper sophomore follow up to “Blackbird.” A menagerie of records collected from around the world, countless sequences, and hours upon hours of digitizing and mastering original vinyl made Martin put his brainchild on hold, only reviving it when the time was right, and turned his attention to writing. Martin spent years planning, outlining and writing a book entitled “Growing Up Analog,” that spans a music history of sorts from 1976 to 1998, detailing his experiences as a publicist in the music industry and growing up outside the digital age. But despite his itch for producing pulp, he was [surprisingly] working on the follow up to “Blackbird,” which [not so surprisingly] coincides to release at, you guessed it, the Sojourner Family Peace Center’s fashion show. If we play Ghosts by the numbers, it would look something like this: Formed in 2010. Release critically acclaimed debut, “Blackbird” in 2011 and play Harley-Davidson Museum. Play Harley-Davidson Museum three (3) more times from 2012 to 2015. In 2016, the fifth (5th) year performing at Harley-Davidson Museum while releasing follow up to “Blackbird” five (5) years after debut. This is the Ghosts in fives. 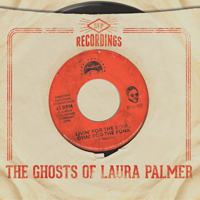 We’ve come to expect the unexpected from Martin and The Ghosts of Laura Palmer. And now, the long-awaited sophomore effort, “Livin’ For The Soul, Dyin’ For The Funk,” is here. The wait is over.